Bitcoin has had a brutal 2018. 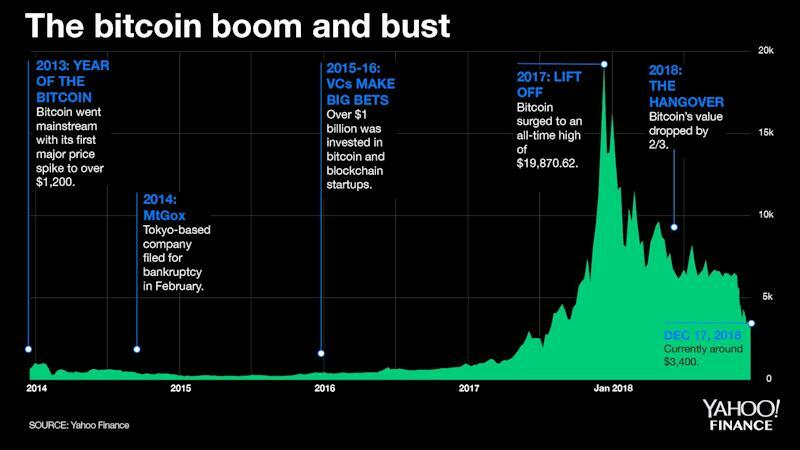 The world’s largest cryptocurrency by market cap has cratered nearly 84% since its meteoric rise topped out at an all-time high of $19,870 in December 2017. But just after bitcoin (BTC-USD) peaked, amidst the maddened buying frenzy, veteran technical trader Peter Brandt made a particularly prescient call, which has recently resurfaced in crypto circles. Back in January, he called for an 80% retrace of bitcoin’s parabolic advance, predicting a $3,933 price target. Bitcoin is currently trading around $3,900. Brandt, a 71-year-old trading veteran, told Yahoo Finance it wasn’t a particularly difficult call to make considering other parabolic advances have typically resulted in a similar crash. And he shared his latest bitcoin forecast. But now that Brandt’s prediction has played out, he foresees less drastic price swings in bitcoin’s near future, despite a recent rebound from about $3,000 to near $4,000 in just the past week. “I really don’t think it’s going anywhere — maybe $4,600,” he said, adding that any rise above $4,000 would more likely be a dead cat bounce rather than a true return to a bitcoin bull market. In fact, Brandt predicts a low of $1,200 if the dead cat bounce materializes and bitcoin dips below the key psychological level of $3,000 sometime by the end of 2019’s first quarter. In his original January tweet, Brandt was careful to note that his call for a more than 80% decline in bitcoin’s price didn’t mean he wasn’t a fan of the cryptocurrency long-term prospects. In fact, even after the precipitous fall, Brandt wouldn’t rule out the possibility that bitcoin returns to its December 2017 all-time high. It will just have to survive the potential dip he still thinks could come.